Available now! 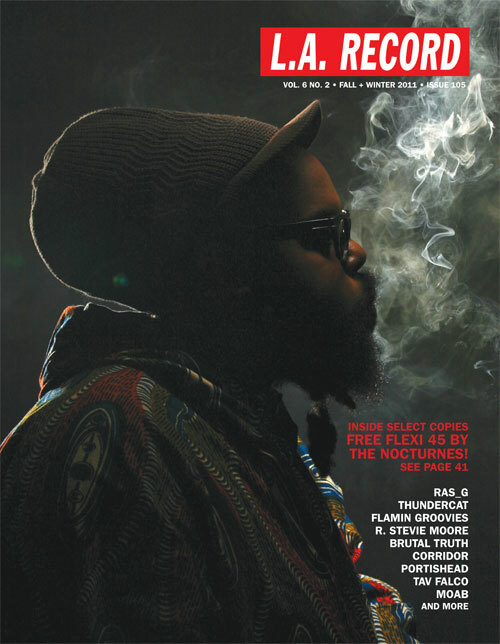 New issue with Ras_G on the cover, Thundercat on the poster and—if you are lucky—a free FLEXIDISC 45 RPM SINGLE by the Nocturnes inside! A real record in L.A. RECORD? At long last, yes. People who order individual copies MAY get one of these very-limited-edition goodies on page 41, but current subscribers and anyone who subscribes starting with this issue will DEFINITELY get one! 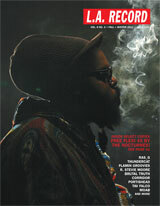 So click here to get this issue and more mailed to you every time! Other good things inside number 105: interviews with Corridor, Brutal Truth, the Flamin Groovies who are in fine form indeed, Zola Jesus, Iggy Azalea, Portishead, Bryan Ferry, the Flytraps and more—like a never-before-published interview with George Kuchar! Plus a 2,000 word review of the Beach Boys' spectacular SMiLE box set, tons of hand-illustrated reviews of local releases, pages of comics on disco and embarrassment and more!